The famous Nigerian prophet TB Joshua of the Synagogue Church of All Nations (SCOANS) is at it again and this time the man of God claims he prophesied the recent death of the former United States President George H.W Bush who died last Friday. 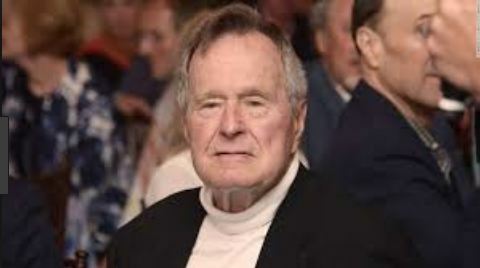 Bush who died at the age of 94 had been receiving treatment for a form of Parkinson’s disease and had been admitted to hospital with a blood infection in April. In his video, Prophet TB Joshua did not clearly disclose Bush’s name rather he only stated to have foreseen the death of an ex-president. “For some time now, I have not been dabbling into international issues, but this one is very close. A president who is very sick outside this country, I am seeing death. This is death. They will try to revive him but no way, “said the man of God. “He has been an ex before now. They will try all efforts to revive him but no way. Open your lips and pray for God’s intervention. “A sudden death. They will try to revive in whatever way. So, you just pray. Let the will of God be done, “added the prophet in the video which can be watched below. It is noted that the same prophet had previously claimed he had foreseen the death of the late President Bingu wa Mutharika saying that a female politician – meaning Dr Joyce Banda – was to take over after his death. He had also previously released a video in which he claimed to have predicted last November’s Zimbabwe military coup and the fall of former President Robert Mugabe.